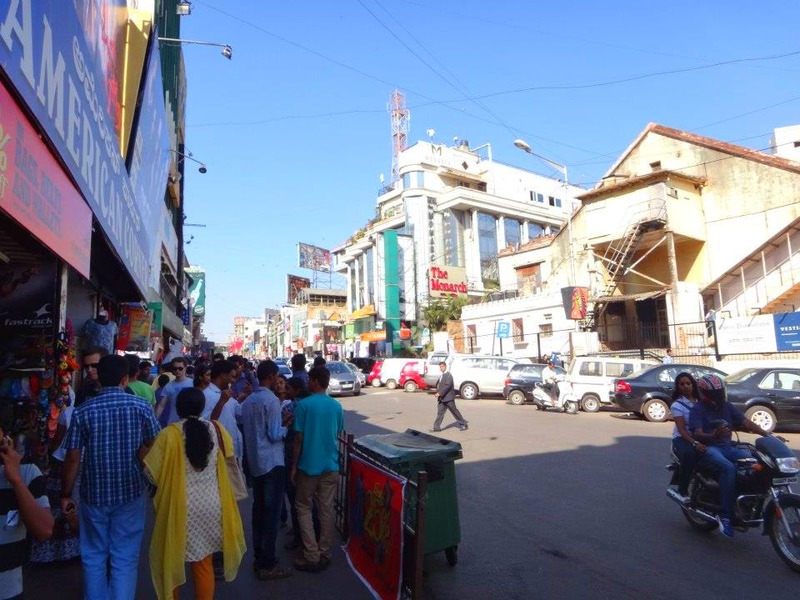 I first heard of Varanasi from a co-volunteer during my first week in India. He said that it is a must for him to visit Varanasi, the Hindus’ holy city. Varanasi is said to be the place where Hindus’ would like to die in, if they get the chance. I was told that it is believed that dying in Varanasi or having their remains sunk below or their ashes scattered across the Ganges River will either stop their reincarnation (maybe especially when they expect to rep bad karma in their next life) and/or go straight to heaven. 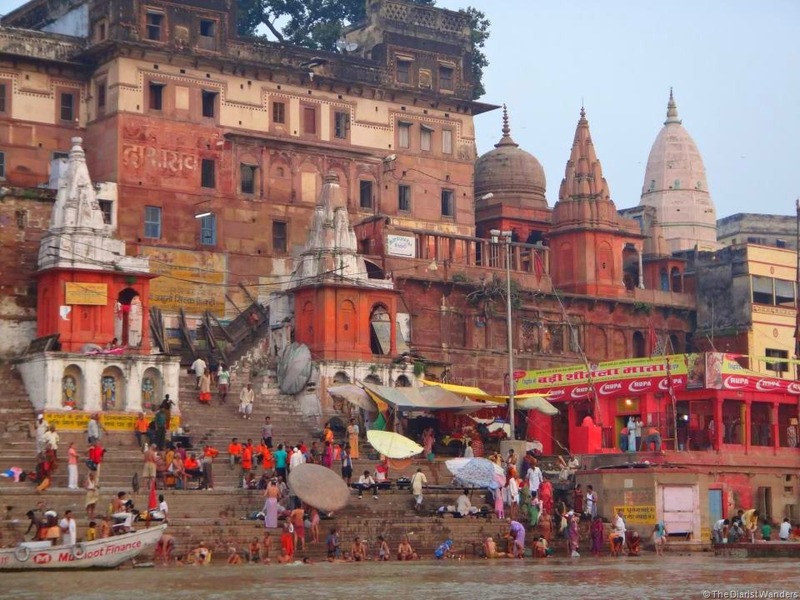 Another reason for Hindu pilgrimage in Varanasi is the belief that you can be cleansed of your sins and cured of your illness once you drink from or bathe at the Ganges River. 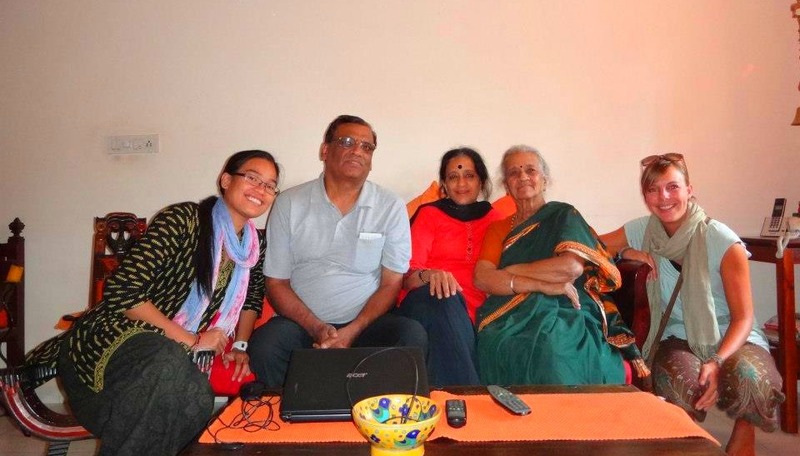 It was in August 2012, while planning my first long holiday in India, that I got connected with Mamtha, a CouchSurfer from Bangalore in Karnataka, India. I was supposed to meet up with her as part of my Mumbai-Goa-Bangalore-Chennai-Pondicherry trip. Working for the CSR Department of a multi-national company, I think she became interested in meeting with me as I was then volunteering in India. Sharing a common interest with a CS member beyond traveling, I was all psyched up to meet Mamtha in Bangalore! Unfortunately though, I got really sick just two days before I was supposed to begin my trip. So, I had to cancel the first leg (Mumbai-Goa-Bangalore) and head straight to Chennai and Pondicherry a few days after my “OMG-I –thought-it-was-malaria-or-dengue” scare. Of course, I missed the chance to meet Sharma but I promised her that if I do get another opportunity to visit Bangalore, I will definitely meet her. In Indian terms, Pakka! So, as part of my South India on a Run (aka final vacay in India), I proceeded to Bangalore after visiting the monuments at Hampi, Karnataka where I also couchsurfed. Mamtha said that she and her husband, Tyag, will pick me up from the Bangalore City Junction train station. Now, not all couchsurfing hosts pick up their surfers. So, that’s a really good indication that your host is very much willing to go out of their way to welcome you! Especially when your train is supposed to arrive at 6 o’clock in the morning!!! Upon arrival at the train station, I saw Mamtha and Tyag even though I don’t know how she looks coz her profile has no photo yet! I guess, you know, you just feel it. But before we could leave the station, I had to ask their help. I was in Sleeper Class Coach #3 when this guy, a devotee I met in Hampi’s Virupaksha Temple came up to me and said that there was a foreign “white” woman in his Coach (Sleeper #8) who looked really distressed and kept crying all night. He offered to help her but she wouldn’t talk to him. So, he wanted me to check on her after we get off the train. So, I had to ask Mamtha and Tyag. Of course, they said yes we should go to her and see if she’s alright. 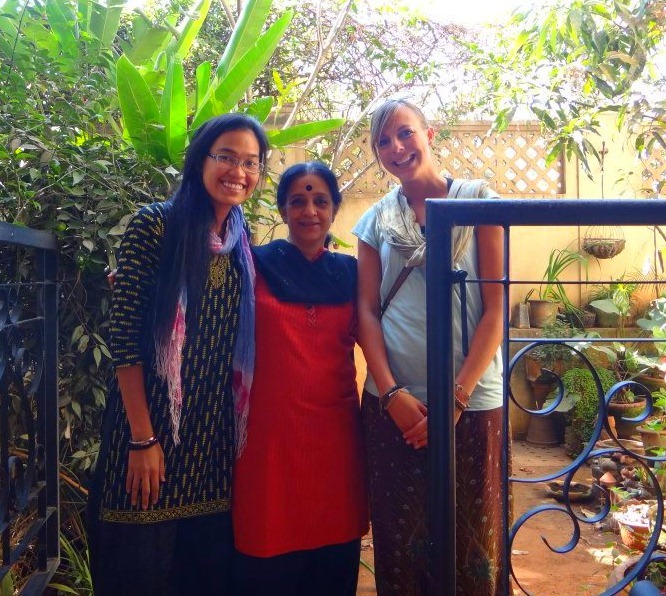 Turns out, Anna is also a CouchSurfer from Netherlands and also just came from Hampi. She was kind of distressed because she was in a section where mostly are men and they just kept staring at her. It is quite common in India (I experienced it too) for men to stare (like, really stare) especially if you are “white”. It does not necessarily mean that they are staring at you like imagining pervert things. It might just be because they are curious and you might be the first foreigner they met (sleeper class coach usually is for lower-middle-class/upper-poor-class) in their entire life. Even so, it can be quite uncomfortable. Anyway, cut the story short, as Anna, like me, is only in Bangalore for a day and heading towards Kerala (further south) in the late afternoon and evening, Mamtha and Tyag also invited her over to join us for the day! YEY!!! 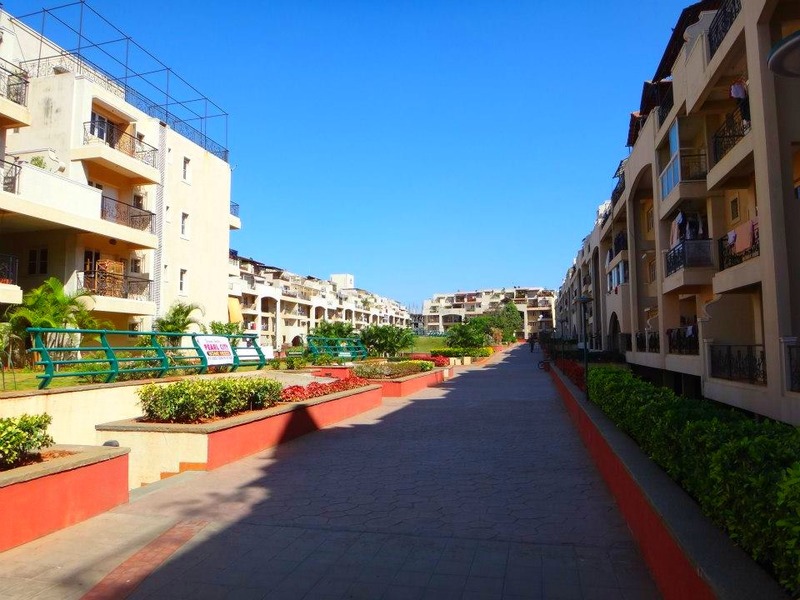 Mamtha and Tyag live in a flat (condo) community in Bangalore (I think they are southside???). They live with Shantu, Mamtha’s 80-year-old mom, and both their daughters are in different states working and studying. Before we met, Mamtha described their home as a “simple middle class Indian home”. Well, after arriving at their home, I thought, she was being modest. I mean, I love their home! Nice furniture (esp the African spine-fitting-chairs! ), spacious hall, green garden (with Ganapathi’s statue nonetheless! ), and with paintings and sculptures too! It is indeed simple. But it’s really classy! 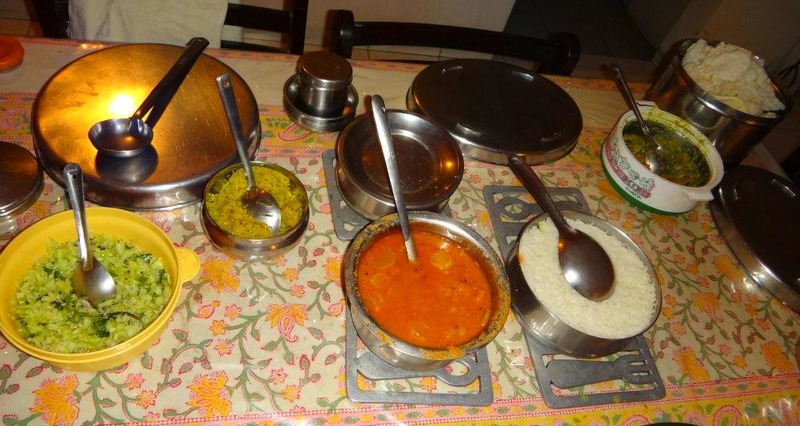 After freshening up, the first order of business was of course, yummy home-cooked Karnataka food by Shantu! 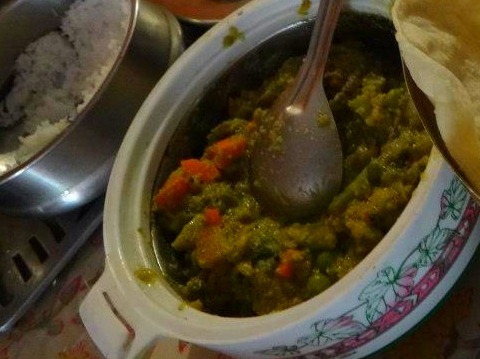 We had poori (fried flour flat bread) saagu (aromatic spices blended with coconut and choice of veggies—I think we had potato, carrots and green peas). The Sharmas are vegetarians so of course, we enjoyed pure-veg goodness. A great way to start the morning with coffee and chai (Indian tea+milk+sugar)! After getting our fill (actually more than because they wouldn’t let Anna and me off the hook until we ate twice our capacity! 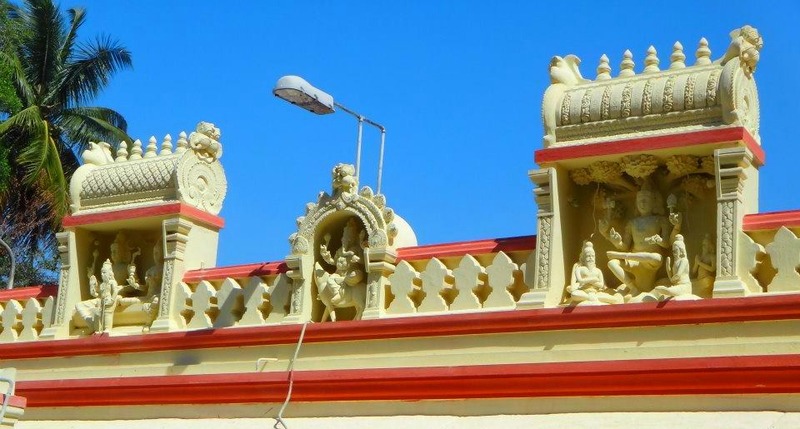 ), we headed to the Gavi Ganghadeshwara Temple in Hanumanth Nagar. An example of Indian monolithic rock-cut architecture (like the Kailash Temple in Aurangabad), the Gavi Ganghadeshwara Temple is also called the Gavipuram Cave Temple. Apparently, the temple was built around the 9th Century (according to Wikipedia) and was constructed from a cave. Mamtha shared that she’s bringing us to THIS temple because it’s got more character than the new ones. 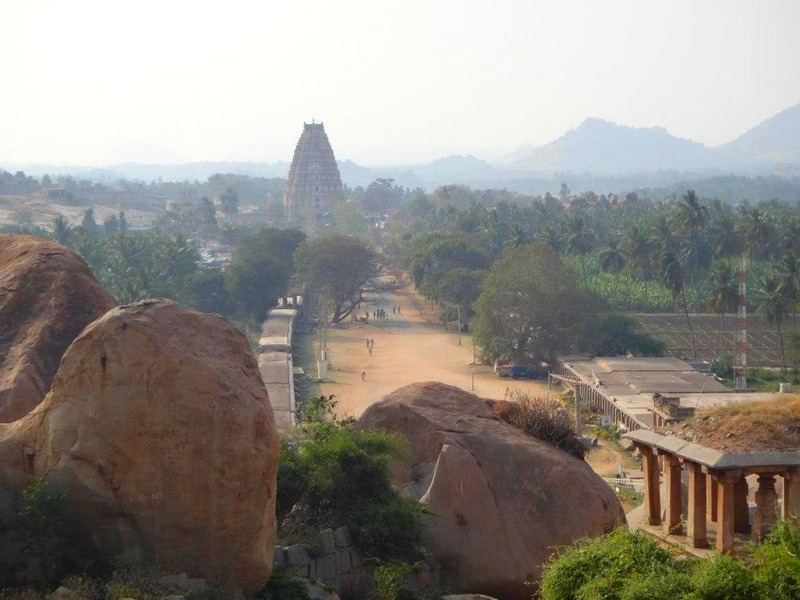 The Gavipuram Cave Temple is dedicated to Lord Shiva, one of the three main gods of Hinduism. 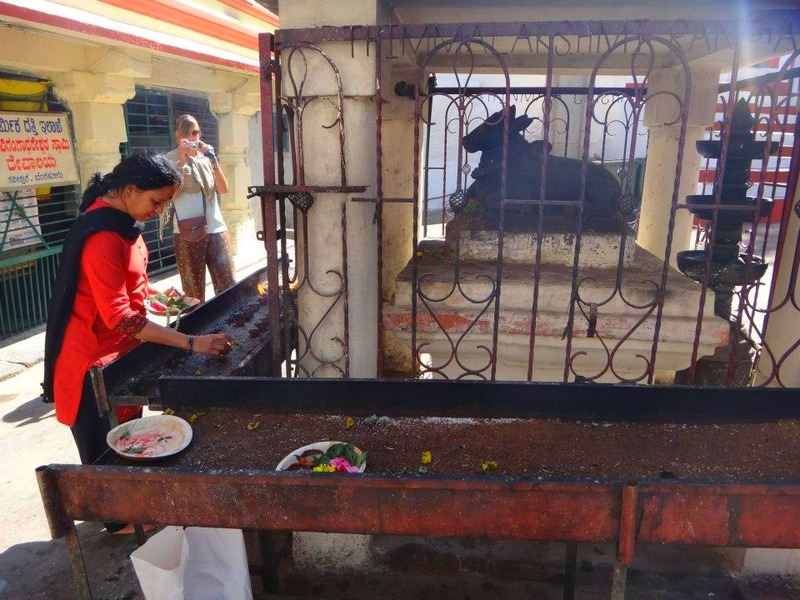 His bull, Nandi, is found in front of the temple entrance, as part of the area where devotees light diwas (oil candles) as part of the offering for the aarti/puja (prayer ceremony) that we became a part of (I’ve been to some pujas but it’s my first time to have it inside a temple, I think for Anna too!). 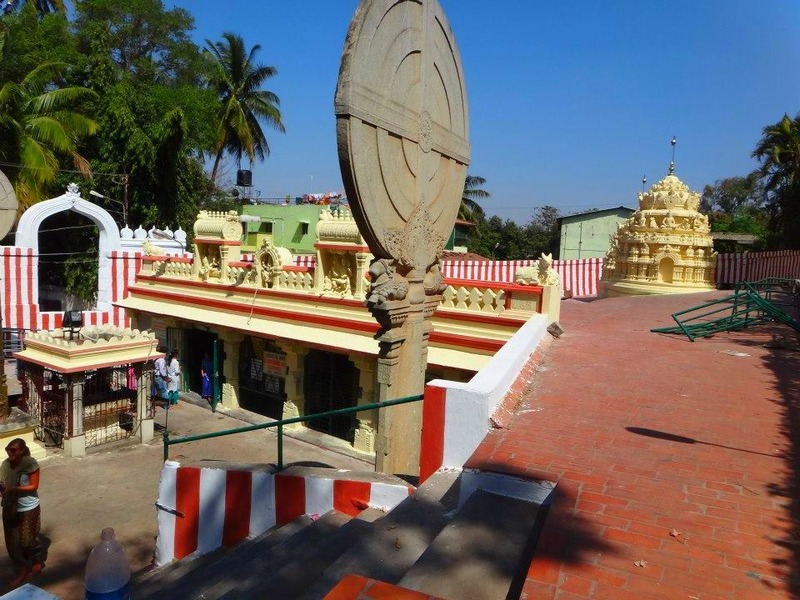 Another interesting feature of the Gavi Gangadeshwara Temple is that the Shivalinga, the main diety, is located at a position where, at certain times of the year, the sun’s rays will pass through the horns of Nandi and light up the shrine! Too bad we missed it! We also missed most of the idols of deities and sages inside the cave, built long, long time ago, even before the records could show, since there’s restoration/construction going on. Mamtha did share that a Shiva statue was wearing a string that is the style of a Brahmin (priests) caste. Now, it is quite unique because Shiva belongs to the Kshatriya (warriors) caste! (Looks like it’s a privileged info as I didn’t find it mentioned in most of the literature for the temple! I so love good ol’ local knowledge!) 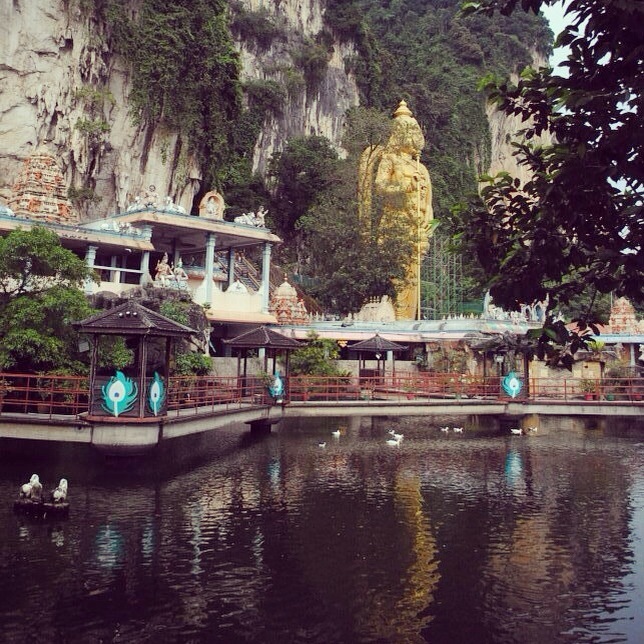 What I didn’t miss though, was the feeling that Mamtha described whenever she goes to this temple. I felt calm and at peace. It’s not like the other new/metro temples I’ve seen that was always buzzing. Apart from the temple prayer/music, I think I didn’t hear other sounds—even the city’s noise was kind of tuned out! Inside Ambara’s main display hallway. The peacock is so massive!!! 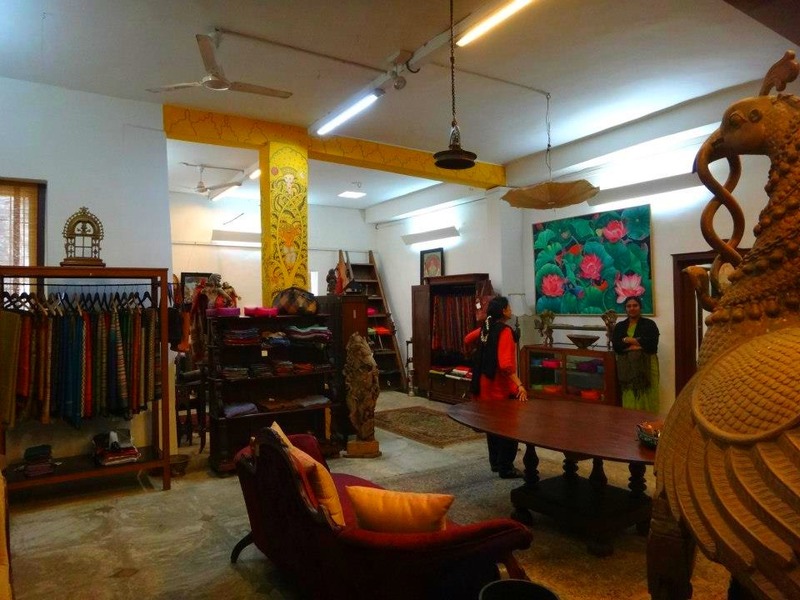 After spending time just chatting and “feeling” the temple (which reminded me of Batu Caves in Kuala Lumpur, Malaysia), we then proceeded to our next destination—Ambara, an antique, arts and crafts boutique! If I wasn’t surfing with Mamtha, I wouldn’t have known about the place. Or, I probably would know but I wouldn’t go. The reason being that Ambara is quite upscale. I mean, with the quality of their products, I think they really are targeting upscale customers. 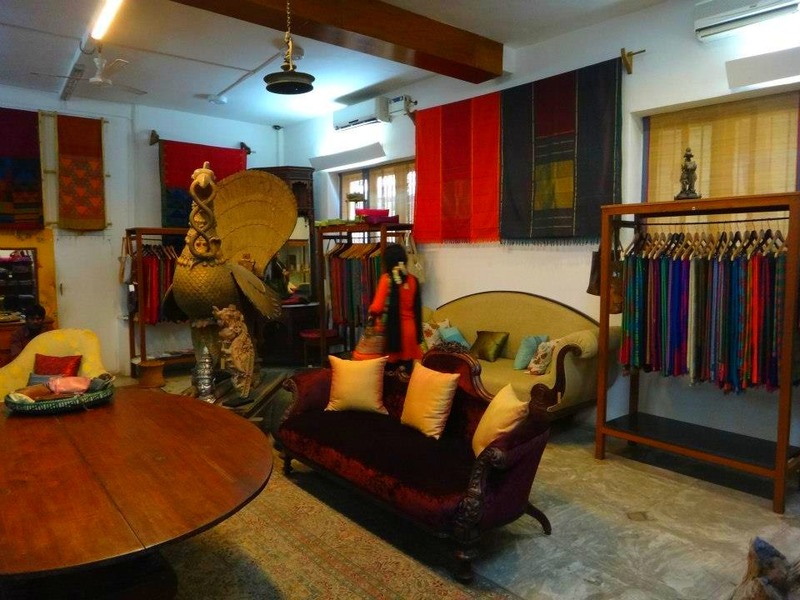 Actually, before entering, Mamtha already shared that it’s an expensive place to buy stuff and our goal is not to buy—it’s to see and appreciate the culture, creativity and craftsmanship of Karnataka. And so we did. I mean, the place is impressively divine! The sarees are lovely and the garments are so rich. The leather bags are to die for! Anna had to “motivate” herself to move on from the grey tote bag she was eyeing. I think it was like 20,000 rupees (PhP 15000) or something! The furniture and sculptures definitely had a lot of character into it, and a hefty price tag too! But, then, as I said, the market is upscale. I do think the products on showcase at Ambara are worth every paisa! Anna wanted to get a kurta and since Ambara is way out of our price range, Mamtha took us to Fab India (imagine the Indian version of Kultura Filipino with more focus on Fashion and lifestyle products). Fab India offers high quality garments with, I should say, reasonable prices. If you are lucky, some might even be on sale! After trying out some, Anna settled for a blue cotton kurta and pledged to get more once she reaches Sri Lanka! And of course, after all this sightseeing and shopping, our tummies have started complaining and we headed back to the Sharma’s home for another round of traditional South Indian lunch thali! And we ate with our hand, or at least tried to! It’s the best way to enjoy South Indian food! On the menu were Rasam or Saru (in Kannada), a sour (tamarind) soupy dish (lots of radish), cabbage palya (stir fried cabbage with shredded coconut), cucumber pachadi (grated cucumber in yoghurt), and my favorite, papadom (crispy fried/flame grilled pringles-like snack/side dish)! The saagu made a welcomed comeback too! Of course, again, Shantu’s cooking was awesome! I don’t need to state how many servings I had, right?! After lunch, it was time to again pack our bags and leave the Sharma’s home. Well, not without a ‘CS-extended-family’ pic of course! Thank God for the timer! So (*sniff sniff*) we had to bade goodbye to Shantu (I asked for her blessing (mano po!) the traditional Filipino way) and the Sharmas’ home! Tyag would have wanted to tour us around their community but we were running out of time. Anna has an earlier train than me so we parted ways at Brigade Road, the central location where Bangaloreans and tourists alike meet. I would say that Bangalore is more, uhm, Western when it comes to dressing up, more western than Mumbai or Delhi. Probably because of the influence of the MNCs (especially IT companies as Bangalore is tagged the Silicon Valley of India) and the influx of foreign students and travelers in the area. 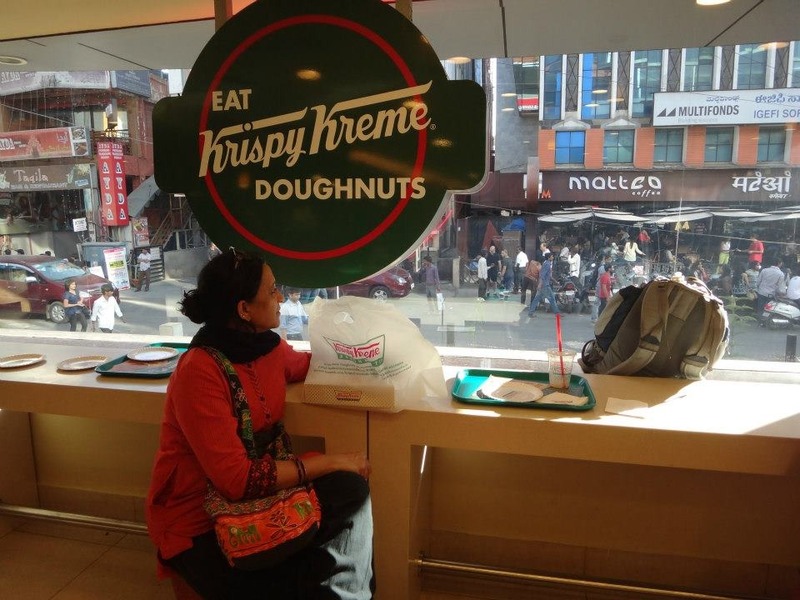 Our time in Brigade Road was made more enjoyable when I saw the familiar Green, White and Red logo of Krispy Kreme Doughnuts!!! Yes, I went so gaga that Mamtha must have thought me crazy!!! 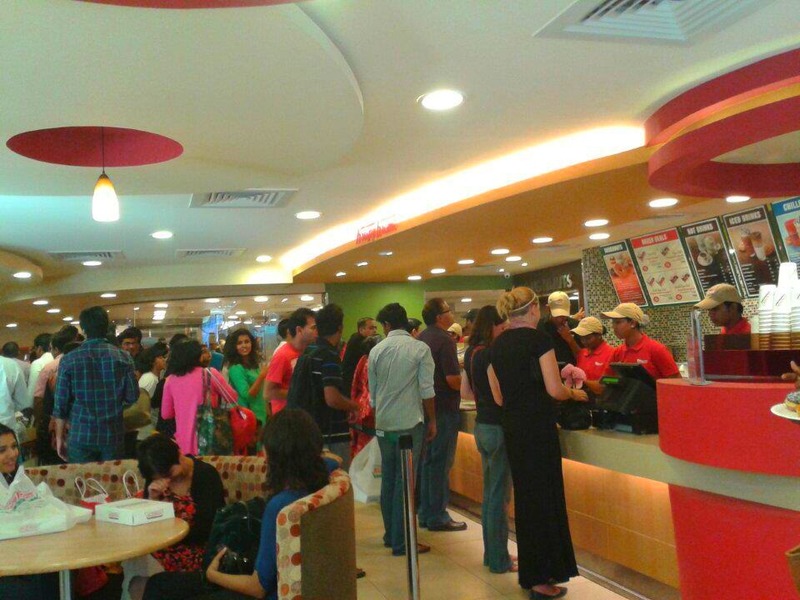 The Krispy Kreme Doughnut store in Bangalore is the first and only in India. So yes, I went gaga! Although the line was quite long, Mamtha and I braved the queue to get a taste of the famous original doughnuts. And yes, she loved it too! She bought some home coz she knows Tyag and Shantu should definitely try it out too!!! I wrote this post not only as a way of sharing the CouchSurfing experience but also as a way of expressing deep gratitude to the Sharmas for sharing a day in their life and welcoming us to their lovely home.